For our recently released new book, Innovation By Design, Thomas Lockwood and I conducted an in-depth study of 21 of the most innovative organizations in the world. As a result of our research, we identified 10 attributes they all share and that they use to leverage design thinking to produce change, drive new ideas, and deliver meaningful solutions. As human beings, what motivates us to want to come together to innovate and create change with the intensity we do? How do the organizations in our study group (among them SAP, IBM, LEGO, NZTE, GE Healthcare and Intuit) create and lead their innovative cultures? These questions are among the most intriguing challenges that leaders of organizations continuously wrestle with. We came to realize that the human energy that brings the 10 attributes together to make things work is The Collective Imagination: The natural desire of human beings to come together in community to collaborate, explore and learn, and create what we want. This is the fuel that provides the substance and underpinnings of our organizational cultures. The Collective Imagination provides the energy for creativity to freely flourish and feeds the innovation within an organization’s culture. 2) Competent and capable; and, 3) Liked and accepted. 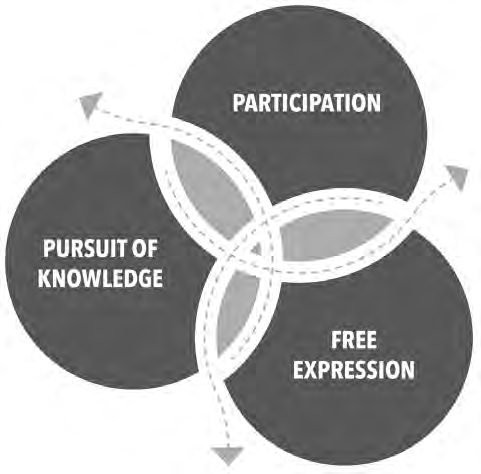 These are the same elements that also make up the motivational drivers of our human ability to innovate and act as the three pillars of The Collective Imagination: 1) Participation; 2) Pursuit of knowledge; and, 3) Free expression. In innovative organizations, The Collective Imagination is at work through the behaviors of involvement, collaboration, and cooperation that result in the sharing of ideas, people paying attention to each other, and the subsequent leveraging of differing viewpoints, inferences, and opinions. The underlying influence that opens the door to successful collaboration among the members of an organization or team is the human need for inclusion. If we dig a little deeper, we find that this natural need for participation and connectivity has a great deal of influence on how people feel valued and respected. This is also what makes listening such a powerful aspect of design thinking. When we feel like we will be paid attention to, and not ignored, we show up, get involved, and share our ideas. Innovative cultures are always hungry for ideas and thrive on finding new ways to understand our world and how human beings and nature function. Fueled by our innate desire to feel competent, have a sense of control, to know more, and to always do better, the pursuit of knowledge is the force of nature behind our ability to think critically, inquire, and ideate. This includes the analysis of data and the use of available criteria, and the seeking of new information to solve problems. In innovative cultures, analytics, data interpretation, and the creation of measurable feedback loops into the prototyping and iteration processes. These are means through which a focus on expanding what we know can become “What if?” questions. As human beings, we are never quite satisfied with what we have, nor what we know. The two are intertwined. To get more of what we want, we seek the knowledge necessary to create what we seek. Our ability to freely express what we think, see, and feel, without the risk of being rejected or not being liked, offers the capability to engage in the unbridled creativity that results in the uninhibited generating of ideas, brainstorming, and the more imaginative and fearless expression of thoughts and feelings. The use of playful and artistic expression is evidence of this basic and yet powerful source of creativity. Fearless exploration is often at the heart of extraordinary innovations. It is important to recognize that free expression is the path through which we open ourselves to being vulnerable and intimate with one another, and express our feelings. In reciprocity, we are more apt to give empathy to those that allow us to communicate without inhibition or fear. Fearless expression is also one of the keys to imaginative communication. It provides us with the sense of childlike wonderment and deeper emotional connection to our work, as well as seeing business as an art form. It reminds us that business is art and that art is the creative expression of human emotion. Put the three pillars in place, and you have the ingredients that manifest in The Collective Imagination and that provide the underlying motivation for our constant and ongoing quest to innovate. As important as the three pillars are to the successful application of design thinking, they are also essential to highly innovative cultures. In light of this, it’s important to note that you can’t succeed by relying on one or two of the three. As fundamental as they are, they are also fully interdependent, and therefore essential to creating success. This is why design thinking plays such a significant role in how innovative cultures attain success. Unlike many other processes that have come and gone, and that have the aim of bringing the power of The Collective Imagination to the forefront, none has been as successful as design thinking. This is evidenced by the level of problem-solving and levels of success being achieved by the highly innovative organizations using it.